Before deciding on witch components to build my Mac Mini media centre from, I had done lots of research. With open mind I had searched the market to find out if a Mac solution even was the best choice. There are a plethora of alternatives. Windows Media Centre, DreamBox, PlayStation3, Xbox 360, Tvix, Popcorn Hour is perhaps the most famous ones. However, since I have a fondness for the Mac platform and my experience of it dates back to the early 90’s, I thought it – from a configuration point of view – would be the best solution. And so it was. 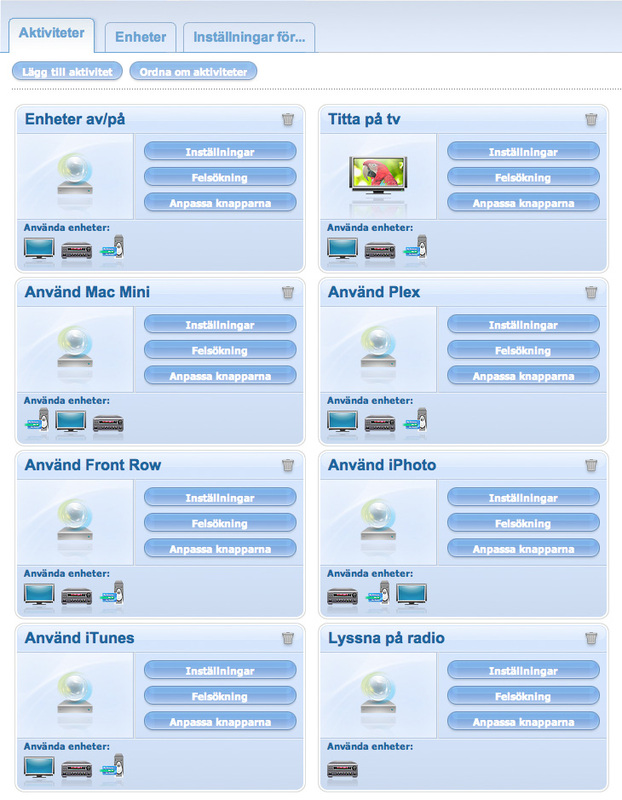 I guess the prize landed at around 16,000 SEK (around 1,600 USD) for all this (TV and receiver excluded), but not more. I must add that I already had an okay stereo system and a great TV. I am very satisfied with the solution, and I do not think I would have been equally happy with a Windows based solution. MacOS X together with iLife (that came bundled with the Mini) is a great combo. You don’t really need much more for a basic media centre. The rest is, so to speak, only icing on the cake. However, this solution has taken me many hours of research and configuration. The setup of the Harmony One remote control, together with Remote Buddy, has undoubtedly been the most time consuming parts. But now everything works great and smoothly. With the Harmony One remote control I manoeuvre most of the functions on my TV, stereo and computer. I can put the Mini to sleep as well as wake it up, start the applications I want and control the functions I like, from the sofa. You can smoothly operate all this with the Harmony, if you spend some time configuring it first. However, one should be aware that a computer solution never can be as smooth and easy to manoeuvre as, for example, a TV. That’s because it is also so much more advanced than a TV. Nor does it currently exist one application for MacOS X that handles all your media (movies, music, live TV, recording etc.). Plex has the potential, but if you want to be able to watch/record TV on your Mac, you still have to rely on separate software for this. I know people are working on integrating TV into Plex. Probably it’s just a matter of time before we can enjoy the fruit of their work. I’ve made some simple performance tests with different films (see the post Mac Mini vs. HD-video, currently only in Swedish). The conclusion is that my Mini (2.26 GHz, 4 GB, Nvidia 9400M with 256MB of VRAM) is capable of displaying “normal” HD movies with bit-rate peaks up to 40 MBit/s. The Mini is fast and swallows most things you feed it. The Nvidia 9400M chipset in the 2009–2010 Mac Minis is optimized to handle h.264 HD video, but this also requires that the software you use can take advantage of it. Today Snow Leopard is required to obtain the h.264 acceleration. A great news is also that the next version of Plex (0.9) will have this acceleration. Primate Labs, who makes Geekbench, has a list of different Mac Minis and their performance compared to the iMac. As information, my configuration scores 3058 points, which is about 10% better than the 2.0 GHz model from 2009. If it’s worth the extra money is up to you to decide. One great feature of the Mini is that it is completely quiet – perfect when using it in a media centre solution. The only thing that has a sound level to be concerned about is the optical drive. It is too noisy to be perfect. However, it’s not nor quieter or louder than any other optical drive I’ve used. One more positive thing, from an environmental and economic point of view, is that the Mini in fact consumes as little power as Apple claims. The Swedish magazine M3 measured its power consumption to the extremely low 12–28 watts, compared to the “less than 13 Watts” Apple claims. Due to the current situation, I use the TV for viewing TV and EyeTV only as a VCR/radio recorder. Because of this I needed a coaxial cable splitter and two coaxial cables for the two antenna inputs, one for the EyeTV stick and one for the TV. Swedish MacWorld has an old but extensive guide (in Swedish) on how to best connect the Mac to the TV. Mac Mini ‘09 to older TV’s. If you have a newer Mac Mini with the GeForce 9400M video chipset and want to connect it to an older TV with no digital inputs – such as HDMI, DVI-D, etc. – the solution may be expensive. Then you have to buy a digital to analogue video converter for around 400–2000 SEK (40–200 USD) that converts the digital signal to analogue VGA/S-Video/SCART/Component/Composite video. The video chipsets in the previous Mac Mini models (prior 2009) outputted both analogue and digital signals, depending on the type of screen/TV connected. The GeForce 9400M chipset in the current Mini’s is only outputting a digital signal through its video outputs. DVI-A outputs only analogue signals. DVI-D outputs only digital signals. DVI-I outputs, beside the digital signal, also an analogue RGB signal. 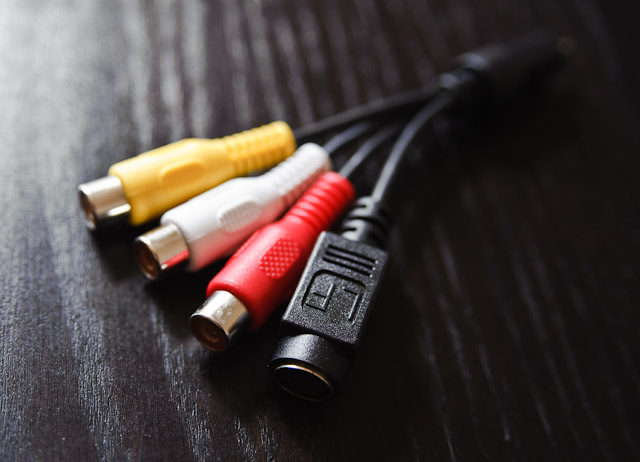 A simple adaptor can therefore be used to connect it to VGA displays. Either way you’ll be restricted to the resolutions your TV and cables can handle. Mac Mini ‘09 to newer TV’s. The Mini is easily connected to your TV through a DVI-D till HDMI cable or an Apple Mini Display Port to HDMI cable. If price is not a problem there are different types of DVI+Audio to HDMI converters that merges the digital audio output from the Mac together with the DVI signal and send it all as an HDMI signal to the TV. Even better is the Kanex iAdapt 51 witch today is the ultimate solution. Better but also expensive. After a little searching in my TV’s settings, I found the menu to enable “maximum viewing area” (so called “over scan”), which is required if you don’t want a black border around the image area. I know cheaper TV’s can have difficulties maximizing the image. This might be worth checking before you go out and buy a new TV. If you encounter problems finding a good screen resolution on your TV, then maybe SwitchResX, DisplayConfigX and Cscreen can work as a last resort, but they probably won’t solve problems with over scan. One more thing you might consider before buying a new TV, is to check weather it supports pixel mapping or not (i.e. so that one pixel in the video output from the computer becomes one pixel on the TV screen). This might sound contradictory but personally I do not take advantage of the TV’s full resolution (1920 x 1080p). I use a resolution of 1600 x 900 (interlaced). This is because the three meters between the couch and the TV otherwise makes it difficult to read text on the screen. A great function in OSX is the ability to zoom in and out on the screen, using the mouse’s scroll wheel. Just press CTRL on your keyboard and scroll the wheel to zoom in/out the area surrounding the mouse pointer (this feature must be enabled in System settings-> Accessibility). Perfect feature if you’re sitting far from the TV. Finally, I can’t say that I have encountered any problems besides some relating to the TV’s refresh rate (see bottom of post). 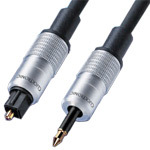 Since it isn’t possible to output audio through the video cable today (theoretically possible through the Mini Display Port but currently not possible), one have to rely on an extra cable for this (an analogue 3.5 mm audio cable or digital mini-Toslink 3.5 mm to Toslink, such as these). In my media centre solution I have made an analogue T-junction between the computer/TV/receiver where the computer’s audio cable (out) splits, both to the receiver (through RCA) and to the TV (through a 3.5 mm audio plug). The idea is that the sound level mainly is controlled using the volume adjustments in OSX when using the Mini. Since I use the TV for all “normal” TV viewing, I also need to have the audio output from it connected to a spare input connection on my receiver, presuming I want the TV audio outputted on my stereo. This means that the audio from the Mini is outputted both to the TV and to the receiver, while the audio from normal TV viewing is outputted to the TV and to the receiver, but on a different port on the receiver. Even if you can, I would recommend to only connect one thing per port on your stereo. If you own a modern sound system, you can get 5.1 sound (DD, DTS) through the optical audio output on the Mini. Thereafter it’s up to the application itself if it works or not. Plex and application that uses Perian/QuickTime are safe bets. Others are more uncertain. Here is a (Swedish) guide on how to get 5.1 audio and surround sound in QuickTime applications. A major benefit of many PC-based media centres is that they often have a display on the front showing what happens inside. This saves you from having the screen turned on every time you want to do something with your computer. I don’t know how well this works in reality, but theoretically it seems to be a nice feature. For Macs, to my knowledge, there are no such solutions. However, there are other tricks to remotely control Macs. Screen Sharing. MacOS X 10.5 and later has a built-in VNC client (System/Bibliotek/ CoreServices/Screen sharing.app ) – a very smooth way to control your Mac over the network.With VNC you can for example, have an old Mac laptop (and even a PC with the appropriate software (in Swedish)) to control your media centre Mac remotely. Thus, eliminating the need of a screen to the latter.Constantly having to switch on and off the TV/monitor for the smallest trifle you want to perform can be quite frustrating. Then a VNC client is a nice solution. Much more versatile, but with almost the same functionality as Screen sharing in OSX, is the Apple Remote Desktop. However, it cost a hefty penny and is primarily intended to aid workgroup administrators handling large groups of Macs.There are also a number of free clients available for download, but I prefer the built-in client of OSX. iPhone/iPod Touch. Probably the best way to remotely control the gadgets in your home. There are countless of apps for this, e.g. Remote, Signal, AJAX (together with Remote Buddy), Bobby, AirRemote, BluEye, Touchpad Pro, UiRemote, Voomote and Total Control app. If this is not enough, there are nine more here and a bunch more here. Mimo Monitors – Cheap and apparently Mac-friendly products. Here is a Swedish test. Lilliput – Wide range of touch screens (here and here are drivers). Elotouch – Wide range of touch screens. Xenarc – Screens perhaps primarily for mounting in a car. Ergoguys – Products to retrofit screens. Troll Touch – Products to retrofit screens. Touch-base – Software to control the touch-sensitive equipment. When you have got the screens working together there are two options: mirroring  where the same image is displayed on both screens  or letting them operate parallel. One problem that arises with the latter option is that you will not see any menu bar on the secondary screen. Then Secondbar, DejaMenu and Dragthing may become useful since they fix this problem (here s a guide to Dragthing). The application Overflow displays an alternative Dock , which also may help you. AirPort Express (AE) is a wireless router that you can connect your sound system or speakers to. It has a 3.5 mm analogue/digital audio output that allows you stream music from iTunes over the network (wirelessly or over Ethernet). You can place it somewhere in your house where your sound system does not reach. The downside is that you must have some sort of computer in order to control the music. AirFoil removes the restriction to only stream audio from iTunes. With it you can stream anything from your computer to the AE.There are similar options from other manufacturers, for example the Logitech Squeezebox and Roku SoundBridge. AppleTV (ATV) is for video what AE is to audio. ATV retrieves and plays media from your iTunes library (on another computer). In some countries you can rent movies from Apple Music Store using the ATV, but not yet so in Sweden.There are many cool custom-built ATV’s. Look here to see what can be done.Other solutions, similar to the ATV, are WD TV Live, Xtreamer and The Cinema Tube. You can describe them as “hard drives with a playback function”. Good value for the money though, since they only cost a few 100 USD. Speech recognition. As early as in the mid-90’s, there was a relatively advanced speech recognition built into MacOS (8.5 I think). Then as now, it was mainly English commands that worked and if you wanted to speak any other languages to your Mac, you had to write phonetic transcriptions of your commands. I believe this still is the case, so I advice you to only speak English to your Mac.What you need is a microphone (an amplified one, or for example an iMic) and then all you have to do is begin adding executable commands in the System Settings. The most time consuming component. After spending lots of time evaluating the different alternatives my choice stood between the Sony PlayStation Remote Control (Bluetooth) or a Logitech Harmony One (IR). I chose the latter and it feels completely right today. With its small touch screen and the ability to create virtual buttons that you can name, it feels like a much better choice. Saying Logitech’s software is intuitive, is a lie. Although I usually learn applications quite easy, this one was difficult. However, it is very competent once you grip the way it works, which everyone can do with a little guidance. Logitech’s concept is to divide the functions of the remote control into devices and activities. This is key. To put it simply: the devices carry the buttons (functions) you pick from when you compose the activities. 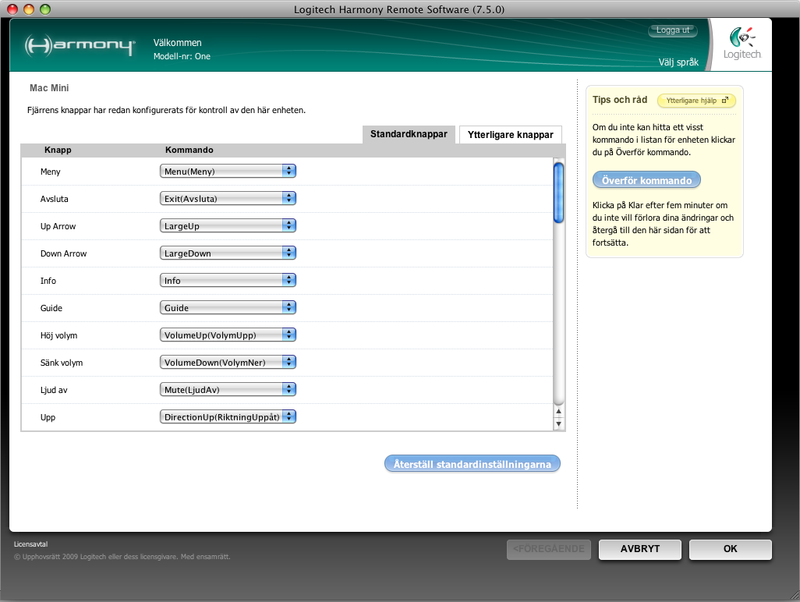 Here is a comprehensive setup guide (current only in Swedish), to both the Logitech Harmony Remote Software and Remote Buddy, which I have written. Under the Devices tab you (surprisingly) configure the devices you want to control with the remote (e.g. TV, DVD, sound system, computer). The setup of the devices is pretty straightforward. It’s all about linking the correct functionality to the right button. After the configuration, each device becomes accessible under the Devices tab on the touch-screen of the remote control. The configuration of the devices is easily done by searching and downloading pre-programmed settings for just the device you’d like to control. The configuration software connects to the Internet and then downloads the button scheme matching the device’s real one. Thereafter, simply sync the Harmony remote with the setup software. There are an almost infinite number of button schemes available for download from Logitech. It’s not likely not finding a matching button scheme for your TV/sound system/DVD. If you still wouldn’t find any scheme, you can read the codes right of your old remote (see Logitech’s help for this), so there are really no restrictions. When you have configured the Devices and fine-tuned their buttons, you can move on to the Activities tab. There you can create an orchestra of individual Devices, playing together through separate buttons and macros calling many functions in a row. Under the Activities tab, you can combine buttons from all your devices into sets – activities – suitable for the activity you’d like to perform. For example, if you want to watch a DVD, you simply press the button on the remote which you’ve labelled “Watch DVD”. By doing so all the electronics you need to watch the DVD turns on and becomes configured automatically (TV, sound system, DVD, etc.). It also activates the right button scheme in the remote, e.g. so that you can control the sound level on stereo with one button and do the DVD navigation with another, but on the same remote. Under the Devices tab in the remote control, you can only control one device at a time; under Activities, you can link different devices to all buttons. For example, you can have the volume button control the stereo, the navigation cross can control the computer and the numerical buttons can control the TV. You can e.g. pick functions from different devices under Activities and combine them. Usually it is best to create activities from scratch (manually) and not involve the “wizard” available. The only advantage of using the wizard is that each activity gets a nice, suitable icon on the remote control screen. The disadvantage, in my opinion, is that the wizard is more difficult to fine-tune and that the accompanying icons doesn’t always match the activity you want to perform. For example, if I would like to have an activity for using iPhoto, I can’t find any configurable activity/icon named something like “Image slideshow”. For TV channels though, there is a plethora of icons available to decorate your TV activities. Otherwise you have to content with the bland “manual” icons. Activities No. 3–8 in the second picture from left in the table above (“Använd Plex” and so on) is somewhat unnecessary to program into the remote; they are only there for treat. The only purpose they serve is to load exactly the same key scheme as the activity “Använd Mac Mini”, plus that they also start the program given in the activity name (Plex, Front Row, iPhoto and iTunes). Besides this, they contain exactly the same key scheme as the activity “Använd Mac Mini”, which contents I have listed in detail in the bottommost images. The problem with IR remotes is that Macs just accept the Apple Remote. In order to use other remotes you’ll either have to buy a Keyspan IR receiver or emulate an Apple Remote. Apple’s remote has 6 buttons while the Harmony One has many more. Then how do you program the Harmony One to use more than 6 buttons/functions? 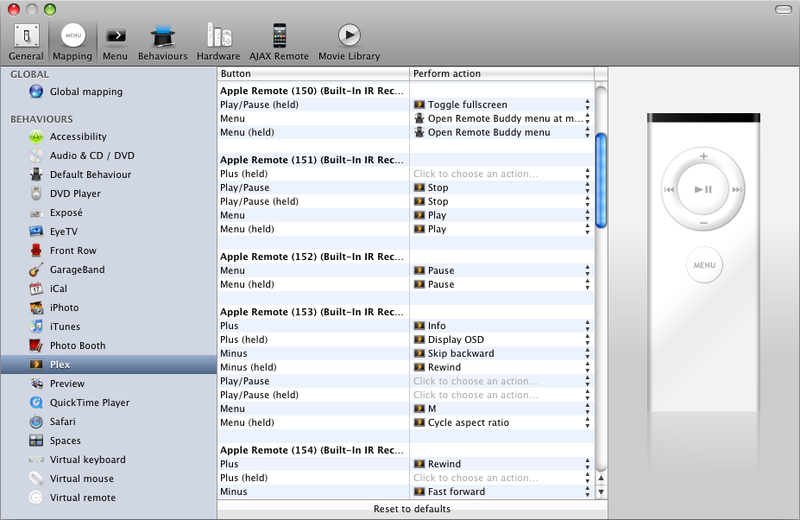 Fortunately, it is possible to use multiple Apple Remotes together with a single Mac. The Mac separates the Apple Remotes through their individual IDs (which can be shifted). By having the Harmony remote emulate a certain number of Apple Remotes (with different IDs), where the total number of buttons matches the Harmony remotes, you can make the Harmony send different commands through different buttons. Does is sound difficult? Fortunately, there are people who already have done the heavy work for us. 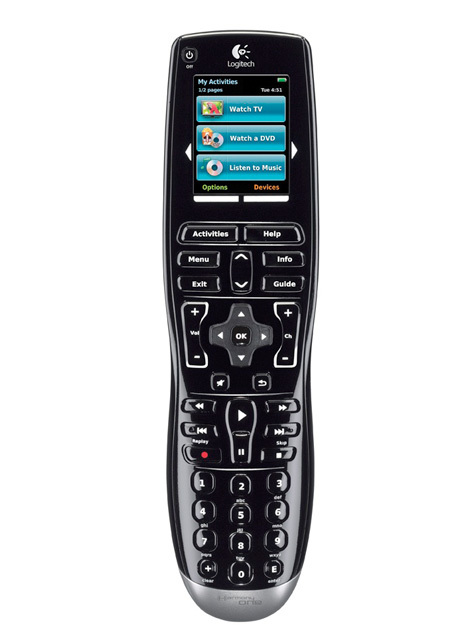 Fortunately you don’t have to buy an Apple Remote and map the 6 buttons a hundred times; there is already a button scheme available through the Harmony One configuration software. Its name is “Plex Player” and you can find it in the Media Centre PC category. The button scheme emulates 10 Apple Remotes. With it you get 58 configurable Apple Remote buttons to map onto your Harmony remote. It may be a bit confusing that the Mac button scheme, when it shows up in the Harmony software, is called “Plex Player” and not Mac-something. The reason for this is that the setting primarily was intended for the media centre software Plex, that has Harmony support built-in. If you – like me – have a TV, a stereo and a Mac in your media centre solution, these components are all the devices you need to configure for your remote control. Start off by configuring the devices, then the activities. One thing to be aware of is that the Logitech software often shows up “Okay” buttons in its interface, which actually are “Cancel-but-save-my-settings” buttons. The interface is quite messy, but you’ll get used to it. After some research I concluded that Remote Buddy probably was the best piece of software to control the Mac using an IR remote control. Besides the Apple Remote (and thus Harmony One) RB also supports the Nintendo Wii remote and the PS3 Bluetooth remote. To see what’s possible to do with the Wii remote, watch the cool demo movies on Iospirits website. Regarding the Wii remote, you should be aware that you must have a so-called “sensor bar” in front of the TV in order to use the Wii remote’s motion sensor. Remote Buddy costs about 20 USD and is required if you want to control the Mac with the remote, at least in any greater sense. There are other, cheaper solutions, but with less functionality, like Sofa Control, iRed Lite and Mira. Under the Preferences menu you’ll find the configuration window where you set the actions to be executed in the different applications when you press the Harmony buttons. Without RB, your remote will just send assorted Apple Remote commands and not perform the expected behaviour of the Harmony remote buttons. Furthermore, you’ll be limited to the 12(1 actions of the Apple Remote. It is RB that interprets the IR-commands, sent from e.g. the Harmony’s volume buttons, that raises/lowers the volume on the Mac. After you have registered all the remote buttons in RB (by pressing all of them on the remote) and deactivated “Paring”, its time to set-up the commands for each application. E.g. you may not want the remote’s play button to send a space key command in both iPhoto and iTunes. Then this must be configured in RB. Although it is possible to make one global setting for the remote in RB (where the same commands are executed in every application), the result will probably not be satisfying. Personally I only use global commands on the things I want globally accessible, e.g. the RB menu, keyboard arrows, quit (long press on the Exit button), return key, etc. (1Apple Remote has 6 buttons, but 12 commands. Each button can be pressed a few seconds and thereby send a different command than the standard. If the predefined commands in RB aren’t enough, you can create your own. You do this under the Behaviours menu. These commands will then be selectable from within the Mapping tab. For more info see the RB’s help section. To make it easy for you to match the Harmony remote buttons to the RB actions, you can download my button scheme (in Word format). Elgato has a variety of TV sticks. Some say they are over priced compared to the competitors’, but I still consider the Elgato sticks are the best value for the money. It is, after all, Elgato who makes EyeTV, which today represents the best piece of software for watching TV on the Mac. However, I know friends who bought cheap sticks and they’ve worked great. It is also said Elgato sticks require a generally higher antenna signal than others to work well. I have not encountered such problems since I have cable TV. I have subsequently come to the conclusion that analogue radio perhaps was not a necessary feature, since the majority of radio stations today broadcast live via the Internet. However, it is always a useful feature if you want to timer record a radio program. The EyeTV package also includes a lead-in video cable (composite and s-video) so you, for example, can connect a video game console or a digital TV box (which, together with the Harmony remote works great). The advantage of a digital TV box is that you avoid the cost of buying a CI module needed to watch the pay channels (probably you also avoid the hassle of getting the CI module to work). The majority of the Elgato TV sticks have a built-in IR receiver. Theoretically you should be able to use it as a substitute IR receiver together with older Macs that are not equipped with a built-in IR receiver. 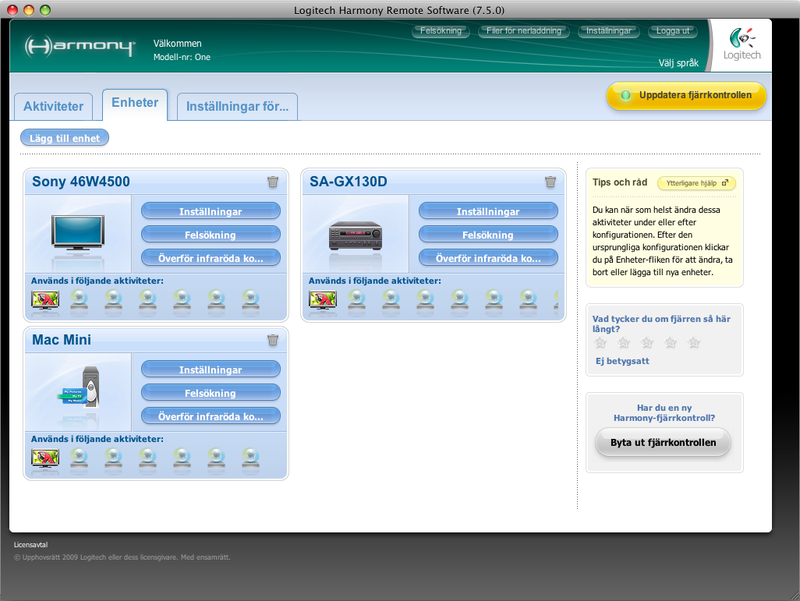 Unfortunately I have not done any testing yet with the Harmony remote to see how/if it works. One problem of using the included EyeTV remote is that the TV stick usually is plugged into the USB ports on the back of the computer and thus becomes “invisible” for the remote’s IR signals. Having the stick lying in front of the computer works, if you have a sufficiently long USB cord – but it is hardly aesthetically pleasing. The software that comes with Elgato TV sticks is very competent, although I think it offers too few settings. Alternatives to the EyeTV are: The Tube, iTV and XTelevision. Timer recording works great, even with the computer asleep. But be prepared to have quite an amount of disk space available since an hour of uncompressed SD video eats up approximately 3.5 GB of your hard drive. Since I currently have analogue cable TV (via the Swedish ComHem) I miss all the interesting information functions digital TV offers, for example program information and so-called “com-skipping”. The latter means that advertising blocks are skipped in recorded material. The plug-in Etv-comskip makes this. EyeTV can handle external sources of EPG data. Usually a 12-months free subscription to tvtv.co.uk is bundled when you buy an Elgato stick. 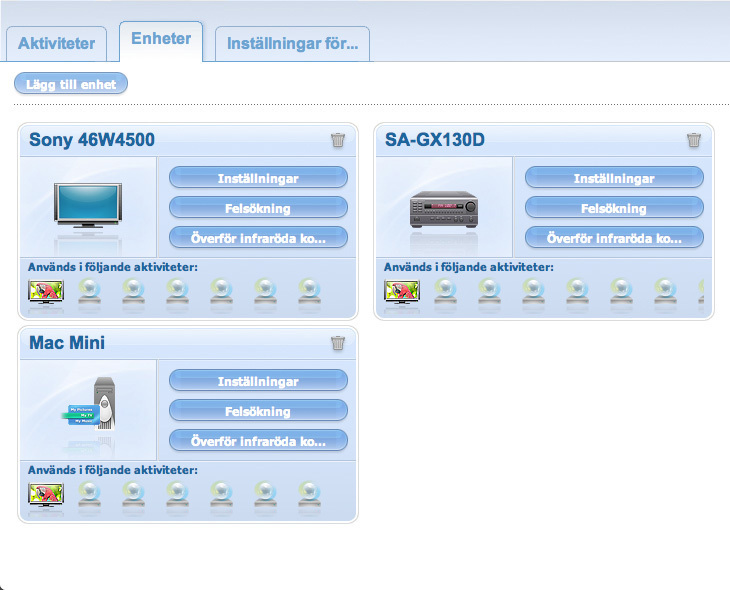 Here’s a guide on how to use external EPG sources in Sweden. In Sweden it is also possible to use the free solution SweDB XMLTV Grabber for EyeTV, which uses the XMLTV and SweDB to fetch the EPG data. Here’s a guide how use it. And here’s another way to download free EPG data to EyeTV. 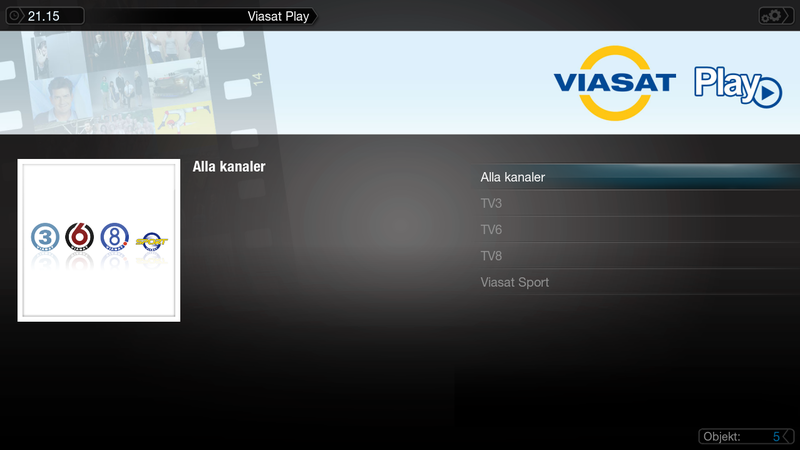 A useful widget that displays Swedish TV program info can be found here. Another nice feature built into EyeTV is that you can share recorded programs over the network. With the free server/client software CyTV it is possible to stream live TV to any computer on the network, and pick it up in – for example – VLC or a web browser. With some luck it is also possible to switch channel in the most recent, sharp version (although I did not get it to work properly). However, by only using the server software, you can easily get it to work, both in the web browser and in VLC (apart from the channel switching that is). A new version (0.7) is underway and it seems promising (still an early alpha version). If you want to reach EyeTV from within Front Row there is a hidden command for this. Here’s a list of EyeTV shortcuts, which can be useful when you configure Remote Buddy. eyetvCamd – Plug-in for “card sharing” in EyeTV. Simply get it from here. EyeTV Over Web – Similar to CyTV this software allows you to watch EyeTV content over the network. Plex is a promising media centre application, still in beta stage. It is based on the open source software XBMC, originally developed as an alternative Xbox interface. Boxee is another member in the XBMC family tree. Unlike the other family members, Plex has been adapted to play along well with Apple’s iLife suite and is now the most “Mac-like” XBMC variant of the three. Sometimes the Xbox heritage shines through in things like navigation and bugs. Plex’s strength today is undoubtedly its features. It’s weak point – if one can call it that – is the interface. Hopefully it will be improved as the development progresses. Plex’s main features are image viewing, music playback, video playback and Internet radio. Especially its video player is probably the best one available for the Mac platform today, since it swallows the video files other players fails to play. To start learning Plex you really just have to start the application. It is fairly self-explanatory and if you would encounter any problems, just consult the start guide. What takes time is defining the sources – which are the places where Plex looks for media files – and the “scraping” of movies – which is the process where Plex ads information and posters to the movies. Plug-ins are very easy to install as this is done from within Plex. Some of the most interesting plug-ins are the tv plug-ins and the ones for Spotify and YouTube. There is also a number of unsupported plug-ins, which you can download and install manually. The Media Server. One important thing to remember is to keep the Media Server running (Settings > System > Media Server >). Turning it off will cause things to behave strangely or not work at all. Weather settings. It is not always possible to enter a nearby town in Plex’s weather settings. Here you’ll see what places you can choose from. Plex Skin Installer. An installer that downloads all working skins to Plex (follow this guide). Manage Your Media Using Plex. A quick guide to Plex, which also shows that Airfoil works together with Plex. Swedish radio. A simple plug-in that makes it possible to listen to Swedish radio in Plex. We hope that it develops further. Advanced Guides. Wiki-page, among other things, describing how to rip Blu-Ray movies. Game Launcher. Plug-in making it possible to launch emulators from within Plex. Hardware accelerated H.264-decoding. Offers a great performance boost to H.264 encoded movies. Requires that your Mac is equipped with the GeForce 9400M video circuit. Works great! 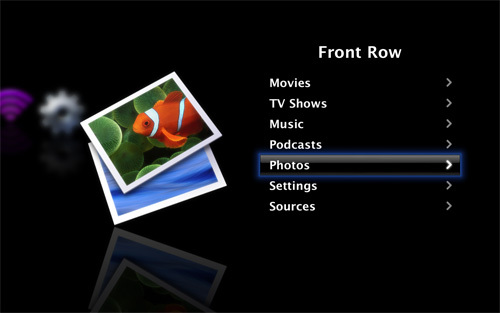 Front Row is Apple’s way of making the content of iTunes and iPhoto easily accessible from the couch, hidden behind a slick and couch-friendly interface. Unfortunately FR’s functionality is quite limited if you want to use media sources other than Apple’s. However, there is plug-ins that makes FR a little bit more fun. PyeTV is one, which allows you to use EyeTV from within FR, which not works very well. Another, similar plug-in is FrontTV. Then there is Sapphire, which provides support for more video formats and automatically downloads movie information from IMDb, etc. – similar to what Plex does. With the Understudy plug-in you’ll get access to streaming video services like Hulu, Netflix, YouTube and BBC iPlayer through FR. With the Emulators Plugin for AppleTV you’ll be able to launch emulators from within FR. Analogue FM radio, as mentioned earlier, is a built-in feature of the EyeTV Hybrid and it works great. After a little tinkering with QuickTime, Flip4Mac and Perian you’ll find that iTunes can become an equally good radio swallowing all kinds of streaming audio formats. As you probably know, there are hundreds of international radio stations available in iTunes by default. If you want even more stations – perhaps some Nordic channels – then you should download and install this iTunes script that gives access to a bunch of Scandinavian radio stations. Update: Please note that Apple has removed the feature to play WMA streams in iTunes 8 and newer. Mac Mini to the TV. The image quality on my TV is superb but there is a problem. Since the computer perceives the TV as just a “TV”, the only refresh rates I can to choose from are PAL (50Hz) and NTSC (60Hz) in the monitor settings. This relatively low frame rate creates a subtle flicker on the TV. In most situations you’ll probably not notice anything, but sometimes you will. My TV supports up to 60 Hz via the HDMI input and probably you can’t get any higher frequency through HDMI. The VGA port on the TV supports up to 75 Hz. I have tried to create custom settings using SwitchResX (set to 1600 x 900 75 Hz) but it refuses to work.Update: After a lot of experimenting, I noticed that the flicker was due to the TV’s low backlight setting. Since all LCD screens suffer from so-called bleeding/clouding in varying degrees, I had deliberately set the backlight level of my TV to a minimum to reduce the effect. Then I discovered that pulling it up to around 60% of maximum made the flicker disappear. However, the bleeding/clouding now returned. My own TV settings can be found here (currently only in Swedish). EyeTV. My first idea was to watch all TV through EyeTV but I soon found out that the video quality of EyeTV was somewhat poor, at least in analogue mode displayed on a 46” TV.I live in a tenant where I can choose from analogue cable TV and digital IP-TV (good picture quality, but it costs extra). What I found out was that the built-in analogue decoder of my Sony TV produced much better video quality than EyeTV, which probably has to do with EyeTV’s lack of post image processing features.So due to this, I only use the EyeTV as a VCR. TV, receiver, Mac. Some electronics uses different IR commands for on and off, so called discrete IR codes. This is a great feature when using them together with the Harmony One remote. Unfortunately my TV, receiver nor Mac is equipped with this feature, which prevents me from making advanced function macros that sends different on/off signals depending on the situation.Consider a case where you have the TV on but all other things in your media centre solution off. Suddenly you want to watch a movie and press the (virtual) activity button “Watch a movie” on your Harmony remote. It is supposed to fire up the TV, receiver and DVD all together. The result you’ll get is that the TV will be turned off while the receiver and the DVD is turned on. And that was not what you wanted.A small but annoying thing. Mac Mini and Harmony One. When I use the remote together with my Mac, I notice that the Mac’s response is slightly delayed. What this is due to, I do not know. Maybe the Apple Remote is inherently slow (I have not had the opportunity to test an real Apple Remote yet). If this is the case, then naturally the same goes for the emulating Harmony remote.I have tried adjusting signal delays in the setup program for the Harmony remote, but to no avail.Update: I finally found a way to speed up the respons of the Harmony (currently only in Swedish). Apple Bluetooth mouse. I have the Mini hooked up on the Internet through a wireless AirPort Express router (G standard) and I have noticed that sometimes it interfere with the Bluetooth signals of my Mighty Mouse. This rarely happens though, only in extreme cases when you push the limit of your bandwidth, then you may notice that the motion of the cursor gets wobbly. Convert FLV to MPEG4. Sometimes it is not possible to convert a Flash Video (.flv) to any QuickTime-friendly format, neither with Perian or iSquint. I guess it’s a bug in Perian that prevents this. However, for me it has worked by simply changing the file’s suffix from .flv to .mp4, and then QuickTime swallows it without any problem.My conclusion is that no conversion is needed as long as the video track in the FLV file is encoded with MPEG4 – you’ll just need QuickTime and Perian. 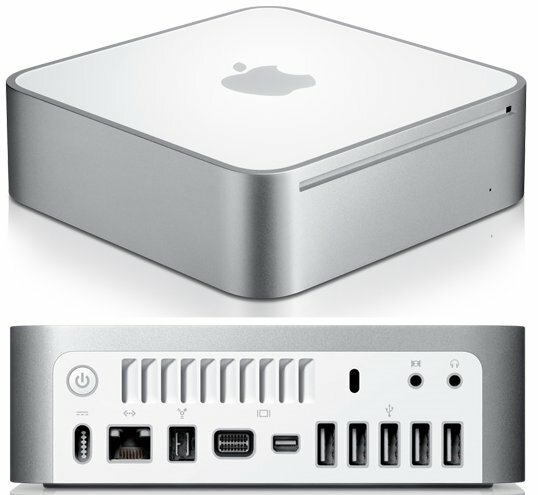 MacWorld.com – Mac Mini media centre solution. Pure-mac.com – Media centre applications. Overclockers – Guide how to create a Mac Mini media centre. Fast Mac.com – Blue-Ray player for the Mac Mini. Amex Digital – Blue-Ray retrofit kit for the Mac Mini and iMac. Handbrake Video Transcoder – Great tool for DVD ripping on the Mac. PS3 Media Server / Nullriver MediaLink / Connect360 / iSedora – To connect the PlayStation 3 / Xbox 360 and UPnP/DLNA gadgets to the Mac. iSquint – A light version of VisualHub to convert various video formats to MPEG4. EMUlaunch – Interface for launching and managing games for around 15 different video game consoles and arcade machines, e.g. from within Plex. AppleScript – Solution to control the Mac by sending emails to it. SubFix – Application to correct timing issues in subtitle text files (.srt). My OSX freeware – Software blog listing new and interesting applications. 123Macmini.com – Discussions totally dedicated to Mac Mini. DLNA Server Comparison Chart – Comparison chart of different DLNA applications on various platforms. Windows Vista Mac IR Driver – Mac driver for using the Apple Remote together with Windows Vista (on Intel Macs). Shades – A small utility for dimming down the screen, or, in other words, adjust its brightness. DiscRotate and Scharping – Lowers the reading speed (and noise) of your optical DVD/CD drive. Resetting PRAM has also been reported to fix loud SuperDrives. Overflow – An alternative dock to open applications and documents. Perfect for a small touch screen. 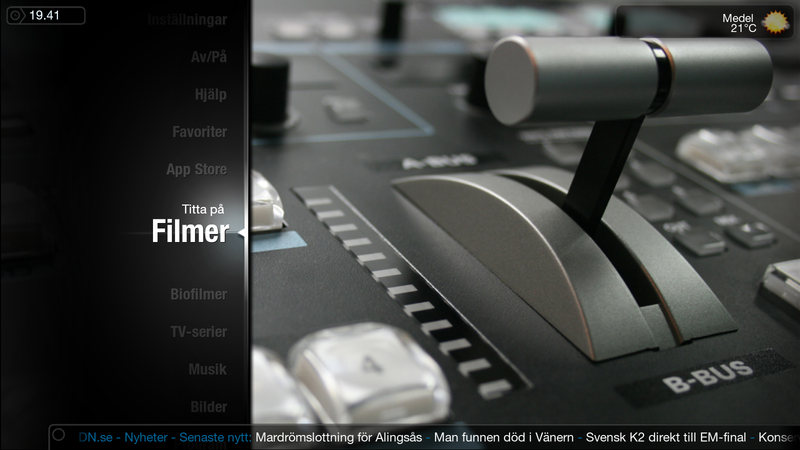 Sandman – Nice and inspiring site for Mac-based media centre solutions (in Swedish). FLV Crunch – Free video converter. Stop Dashboard widget – Kills the Dashboard to free up RAM and CPU power. Burn – Free and versatile CD/DVD burner. MakeMKV – Application for ripping DVD/BD on the Mac. Subler – Add/edit data tracks in MPEG4 files. Teleport – Use several Macs simultaneously by sharing keybord, mouse and clipboard between them, like if the only were different screens. VideoSpec – Application giving detailed information about video files. Install a Mac without a screen – Guide how to start and configure it without the aid of a screen (by using a MacBook though). My ambition is to supplement this tutorial with all new things I discover regarding Mac and media centres. Hopefully my work will become useful to someone, despite my insufficient English. Comments, corrections and suggestions are greatly appreciated! Tack för bra information om mac mini som mediecenter. Jag har bara en fråga vilken konfiguration har du på din mac mini? Jag maxade den allt vad jag kunde: vilket innebär 2,26 GHz, 4 GB RAM, Nvidia 9400M. Det var det “fetaste” som gick att få i april 2009. Sliter mitt hår med att försöka få upp bild från min Mac mini (gammal 1.42 GHz) på en Sony KDL-46W4500. Har provat både DVI-HDMI och DVI-PCingång, men utan resultat (helt svart). Ska bara ha den till iTunes och iPhoto. Har du nån tips på inställningar på TV eller minin’n? Vet du någon inställning i SwitchResX som funkar för dig? Jag har Minin (OS 10.5.7) ansluten till ingången “HDMI 2″ på tv:n och det funkar perfekt, bara jag väljer den ingången via fjärrkontrollens “ingångsknapp”. Och jag har inget minne av att det var några problem när jag för första gången slog på Minin heller. Datorn har bildskärmsinställningen “1600 x 900 (sammanflätad) 60 Hz (NTSC)” vald. SwitchRes tror jag du kan glömma direkt. Jag har aldrig fått det programmet att fungera något vidare. Det jag kan tipsa dig om är att (1) Googla, (2) resetta PRAM eller (3) latja med tv:ns inställningar under Inställningar->Inställningar->AV-inställning. Hör av dig med mer info om inget av detta funkar. Jag har googlat en hel del och hittat mycket som inte hjälper mig. Tänkte att din lösning var så nära det jag planerade så att jag skulle komma närmre. Reset PRAM hjälpte inte. Vi ett tillfälle fick jag bild på Sony’n som flimrade till och försvann igen. Kör parallellt med en Dell-skärm, men kan inte köra den samtidigt. Men nu ska du få höra nåt som jag tycker är ännu märkligare. Jag kopplade in Minin på en annan TV (32″LG) för att se hur det gick. Allt funkade klockrent. På bildskärmsinställningar hade LG identifierats och allt var stabilt. Tills jag justerade bildupplösningen (från 1360×768 till 1600×900 (sammanflätad). Då blev det “ingen signal”. Det som händer nu är att bilden med “gråa äpplet” och “Startar MacOSX” visas när jag startar och sedan blir det svart. Varje gång. Därför kommer jag aldrig åt att ändra tillbaka upplösningen. Vad tror du om min tolkning? Är det TV’n som får resettas? Testat med PC-laptop på båda TV. Funkar utan problem. Lite justering i NaVida’s inställningar bara på Sony’n. Hoppas på någon genial lösning. Det låter underligt att bilden först dök upp och sedan försvann. Pröva att välja någon av dem när du har Dell-skärmen inkopplad. Stäng sedan ner Minin och starta den igen, denna gång med Sony-tv:n inkopplad. Det kan kanske fungera. Jag förutsätter att du testat att koppla in Minin i alla olika HDMI-ingångar i tv:n. Annars, testa det. Ytterligare tips är att koppla samman Minin med någon annan Mac över nätverk och manövrera den via VNC-klienten som finns inbyggt i Leopard. Då kan du latja med Minin trots att du inte har någon bild på tv:n.
XBMC skulle man kunna kalla en vidareutveckling av XBMP, xBox Media Player, som också är ett opensource-projekt framknackat av duktiga ihärdiga människor och inte har någon anknytning till Microsoft. Programmet möjliggjorde att man kunde kringå regionsskydd och Microsofts egen DVD-dongle (krävdes och såldes separat för att kunna titta på DVD-film) samt spela upp andra fil-format direkt från hårddisk eller skiva. Utvecklingen av XBMP lades ned 2003/2004. Då hade XBMC vuxit upp och släppts i flera olika beta-versioner som under längre tid konkurrerat med XBMP och under 2004 släpptes en “officiell” version, 1.0, av XBMC. Utvecklingen fortsatte som vanligt ändå med nya publika versioner varje vecka med nya funktioner och buggfixar. Det som skiljde de olika mediaspelarna åt var att XBMC innehöll en mängd nyttiga och trevliga funktoner som t.ex. ftp och scriptspråket Python som i sin tur öppnade dörren till ett mer avancerat gui och skin-hantering och mängder med nya funktioner och tillägg i form av olika script (som t.ex. XOT, SVT-play). Utvecklingen gick i en rasande fart och nu kunde ägare av en modifierad xBox få ett snyggt och kraftfullt medicenter gratis. Alternativt köpte du en konsoll för ca 2 000:- och stoppade i chip 6-700:- och vips hade ett medicenter för under 3 000:-. XBMC blev kraftfullare och snart blev xBox:ns hårdvara en flaskhals så tekniskt sett var det dags att gå vidare. Tillsammans med sin populäritet tog projektet steget till flera plattformar som Pc, Linux, Ps3, Mac etc. Hur det sen bröts ur och blev Plex på Mac tycker jag var lite synd, hade hellre sett att alla arbetade tillsammans för att föra hela applikationen framåt, nu har det istället blivit två grenar. Jag har provat en mängd olika mediacenter-mjukvaror och den ena är pinsammare än den andra. Trots stora företag som t.ex. Microsoft prickar man fel… det finns enligt mig endast en mjukvara som duger oavsett plattform och det är XBMC/Plex… en mjukvara som drivs framåt av vad vi användare vill ha och göra. Inget företag kan gå in och bestämma och begränsa oss! Hej, grym genomgång, har haft samma setup ett tag nu. 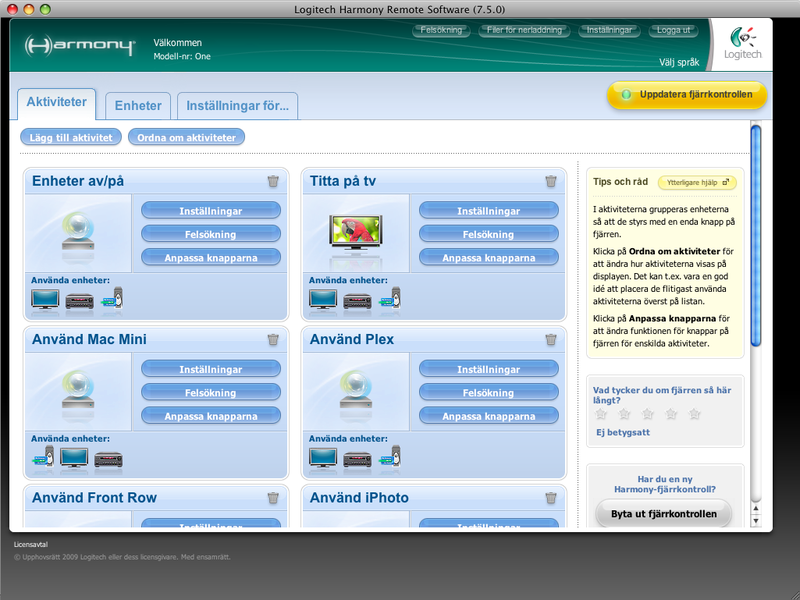 Har du lyckats skapa Harmony aktiviteter som automatiskt startar Plex, Front Row, iPhoto etc? Skulle isåfall vara intresserad att höra hur du löst det? Jo, det är inga problem om man har Remote Buddy. Jag har skapat olika AppleScripts i RB som startar de program jag vill. Är man helt novis på AppleScripts finns mycket guidning på nätet. Eller så kan man använda programmet Manusredigerare för att spela in actions (och sedan kopiera den alstrade källkoden till RB). För F-tangenterna, som finns mappningsbara i Harmony-mjukvaran för enheten Plex, har jag skapat virtuella knappar som heter “Plex”, “EyeTV”, “FrontRow” etc. Med “virtuella knappar” menar jag de knappar som syns på fjärrkontrollens touch-skärm när man har en Enhet eller Aktivitet aktiverad. När jag trycker på dessa knappar aktiveras ett AppleScript i RB som utför det kommando jag önskar. För att förenkla mappningen mellan Harmony och RB kan du använda den här tabellen. AppleScripten skriver du in i RB under Remote Buddy -> Behaviour Construction Kit -> Action Factory och dessa blir sedan valbara under Preferences -> Mapping för alla knappar. Detta förutsatt att du har kryssat i “Globaly available” för ditt Action. Sådana kommandon som att starta och stänga av program tycker jag bör placeras som en global mappningskarta i RB under Preferences -> Mapping -> Global mapping. Detta för att man vill kunna nå kommandona oavsett vilket program man har aktivt. I Harmony-konfigurationsmjukvaran går det, som du kanske vet, att även skapa händelsesekvenser som utför flera händelser på rad. Sådana sekvenser tycker jag dock bara att du ska använda när du vill skicka kommandon till två eller flera enheter, t.ex. Minin och tv:n. Ska du utföra en kommandosekvens enbart på Minin tycker jag att det är mycket bättre att göra detta genom AppleScript. Läste att du hade problem med av/på-signaler till flera enheter. I Harmony-konfigureringsprogrammet så finns det en inställning (Aktiviteter -> Inställningar -> Ändra alternativ -> “Stäng av oanvända enheter”) som låter andra enheter vara på trots att du väljer en ny aktivitet. Jag kanske missuppfattade dig, men denna inställning gör iaf jobbet för mig. Jag kan ha igång TV:n och sedan välja aktiviteten “Plex” som då startar TV + Plex + stereo utan att TV:n stängs av. Den ställs bara in på rätt ingång. Hoppas detta kan hjälpa!? Vissa “finsmakarmärken” inom hemelektronik, typ Denon, Nad och säkerligen Bang&Olufsen, har ett IR-kommando för “on” och ett annan för “off”. Fördelen med att kunna skicka två olika IR-koder är att ett “on”-kommando aldrig stänger av enheten och ett “off”-kommando aldrig startar enheten. Detta är ypperligt när man har att göra med en avancerad fjärrkontroll som Logitech:en, eftersom den aldrig vet vilka enheter som är av eller på. Jag har använt samma princip som du. “Problemet” är att jag måste ha alla enheter i samma läge (on/off) för att dom inte ska gå bananas när jag trycker på “Starta alla enheter”. Tack för en ypperligt skriven och informativ guide till flera aspekter av mac som multimediacenter. Har själv haft en Elegato Hybrid som inspelningsfunktion i ett ComHem hus. Nu har Com Hem bestämt sig för att släcka ner det analoga basutbudet och vi har nu digitalbox. Har du drabbats av detta och vad har du i så fall för tankar om förändringar av mediacentret. Om det är det “normala” marksända digitalnätet ni går över till så borde det inte vara några som helst problem, tvärtom! Du får (mycket) bättre bild och fler funktioner. Enda problemet som jag kan se är att du troligtvis måste göra om kanalsökningen (kanalinstallationen) i EyeTV. Går ni över till Telias eller något annan leverantörs digitaltvutbud kanske det blir lite bökigare, men knappast fördärvande. Ser ju otroligt trevligt ut detta. är otroligt sugen på att byta ut min nuvarande htpc mot en liknande uppsättning du har. har en fråga ang. eyetv, har i nuläget digital tv via adsl men kommer troligtvis efter årskiftet kunna byta till hdtv via fiber som installeras snart. vilken eyetv är det jag bör ha och hur kopplar jag in den? du ska ha mycket cred för denna sida, verkligen intressant läsning. Svårt att säga. Själv har jag ju bara erfarenhet av EyeTV Hybrid ’08, och den går det, som jag skriver, att ansluta både (analog) composite och s-video till. Hybrid-stickan klarar både (okodade) DVB-T och DVB-C-signaler, så överensstämmer de med dessa standarder så borde det funka. Är det däremot IP-tv det är frågan om så måste du gå via en analog omvandlare – t.ex. i en tv-box – för att få in signalerna (analog SD-kvalité) i EyeTV. Slutsats: HD funkar bara om de sänds via DVB-T och DVB-C och jag kan tyvärr inte rekommendera någonting om jag inte vet vad det är för tekniska förutsättningar. Jag inflikar denna post eftersom jag inte hittade bra info ngnstans. Har MacMini som mediaspelare/iTunesbibliotek. Timecapsule i garderoben med alla filmer på. Skärmdelning!!! Jag hade ingen aning som nybliven macägare att denna funktion fungerar så bra. Nu står MacMinin gömd i stereohyllan, tyst, och jag sköter hela biblioteket, uppspelning, nedladdning, mm från min MacBook. Väldigt smidigt. Helnöjd! Nu sätter jag bara på min projektor då jag valt klart film i PLEX via skärmdelning. Så MacMini fungerar faktiskt väldigt bra, även utan skärm!!! Jag skriver detta för att jag vet att det finns många som är musikinresserade men inte nödvändigtvis så insatta i Os X.
Ska köpa kabel i morgon till LCD tv vad jag försstår måste det vara separat kabel för ljudet. Länken till Logitech Harmony One fungerar inte. Jag hittade en som fungerar åt dig. Så du menar att det går att använda en PS3 remote till OSX? Hur skulle detta då gå till? Jag har inte haft möjlighet att testa det själv, eftersom jag inte äger en sådan fjärr, men om du kollar på Iospirits hemsida så ser du att det finns stöd för Sony PS3 BD Remote Control. Jag ser inte varför det inte skulle fungera? Tänkte mest om man behöver speciell mjukvara. Kan man använda flera tvmottagare utan problem? Enligt det lilla jag har läst på Elgatos supportforum så verkar det inte vara helt smärtfritt, men funka hyggligt. Jag har läst om personer som har vissa problem när det gäller att få EyeTV att skilja på de olika tv-stickorna, t ex vid inspelning. Men jag är alldeles för dåligt insatt i detta för att kunna ge något bra svar, tyvärr. Kolla på Elgatos supportforum eller Googla. Vilken bra resurs! Jag hade själv problem med att ansluta Minin till en Samsung-HDTV. På högsta upplösning blev skärmen helt svart. Då hittade jag tipset att köra Remote desktop in i Minin, och där ställa om frekvensen från 60 Hz till 59,9 Hz. Efter det funkade allt klockrent. Bra genomgång! Har samma rekommendation! Om nån vill komma igång snabbt säljer jag min gamla mini med core 2 duo 2.0 processo. På Blocket med massa tillbehör för 3900kr. Kan tipsa om iPhone som komplement till medialösningen, köp Rowmote pro till iPhone så styr och startar du alla program med ett enkelt gränssnitt, har även touchplatta som funkar som mus! Sen är Airvideo app också GRYMT! Om du vill titta klart på filmen i sängen på mobilen eller kolla på bussen till jobbet så hittar Airvideo filmerna över 3G och streamar med riktigt bra kvalitet i alla filformat med realtidsomkodning. Vidare är EyeTV app till iPhone ett rekommenderat köp, styr tv och planera inspelningar både hemma och på stan. Vill du kolla nyheterna från jobbet går det också bra – streaming funkar kanon på wifi. alla ni som kör eye tv o elgato vad har ni för tv signaler ? Går det inte att få in sina spotify spellistor man skapat tidigare när man kör spotify genom plex ? Hej! Tack! En fråga jag sökt efter och funderar på; man kan inte koppla upp sig i Plex till cdon eller liknande för att få filmtexter och bilder på svenska i sitt filmbibliotek? Någon som vet? Jag har kollat runt lite på nätet eftersom jag har funderat över samma sak, men ej funnit något svar. Förmodligen är det inte så pass enkelt som att det bara är att ange en sajt som källa för bilder och texter och sedan tanka ner datan, utan mycket mer komplicerat. Dock finns det en annan lösning på problemet. Om jag inte minns fel så går det att manuellt lägga in en bildfil och en textfil med samma namn som filmen, i samma mapp som den, och på så sätt få informationen att synas i Plex. Men det får du, som sagt, göra manuellt. Kan inte lyckas få min harmony one fungera som jag vill. Vilken ände ska man börja i? Köpa remotebuddy och göra inställningar där i eller göra inställningar i logitech mjukvaran? Jag instämmer i att det inte är helt enkelt att begripa sig på inställningsmjukvaran för Harmony-fjärren. Men du måste vara medveten om att du, för att framgångsrikt kunna styra något annat än Plex, MÅSTE ha Remote Buddy installerat. Annars blir du begränsad till de få knappfunktionerna som en Apple Remote har. 1. (Harmony-mjukvaran) Lägg till “Plex Player” som en enhet under “Enheter” tillsammans med din tv, stereo etc. (läs avsnittet “Fjärrkontrollen”, “Apple Remote-dilemmat” samt “Emulera Apple Remote(s)”). Märk dock att jag i mina skärmdumpar har bytt namn på enheten “Plex Player” till “Mac Mini”. Det är dessutom viktigt att “Standardknapparna” blir inställda EXAKT som jag visar i mina skärmdumpar. Annars kommer inte mappningen mot Remote Buddy (eller Plex) att bli korrekt. 2. (Harmony-mjukvaran) Mappa knapparna för enheten “Plex Player” mot fjärrkontrollen (dvs så att “Meny”-knappen mappas mot “Menu”-kommandot för enheten “Plex Player” osv). 3. (Harmony-mjukvaran) Skapa en aktivitet under “Aktiviteter” (exempelvis med namnet “Använd Mac Mini”) där du anger vilka kommandon/makron som ska finnas tillgängliga när du har aktiviteten aktiv. Det är viktigt att “Standardknapparna” blir inställda EXAKT som jag visar i mina skärmdumpar. Annars kommer inte mappningen mot Remote Buddy (eller Plex) att bli korrekt. 4. (Remote Buddy) Tryck på alla knappar på Harmony-fjärrkontrollen så att de tio “virtuella” Apple Remotsen registreras i Remote Buddy. Var säker på att kolla så att Remote Buddy är “Unpaired” med “Apple Remotsen”. 5. (Remote Buddy) Ladda hem min knappuppsättningskarta och börja mappa Harmony-knapparna mot Remote Buddy. Börja förslagsvis med de få globala knapparna som behöver ha samma funktionalitet oavsett applikation (under “Global mapping”). 6. (Remote Buddy) Mappa sedan knapparna/kommandona för varje applikation. Det är den snabbaste lathunden jag kan ge dig. Jag måste få veta närmare var du har kört fast för att kunna hjälpa dig vidare. Som du kan se nu har jag lagt upp en ganska omfattande walkthrough om hur du får Harmony-fjärren att funka tillsammans med Macen. Hej, verkligen bra info! Jag undrar hur bra den visar bilder på HD tvn? Har bilder ligger på en NAS och vill via MAC Mini kunna snabbt visa dom på tvn. Hade tankar på att skaffa en PS3 men MA Mini verkar bättre. Jag är mycket nöjd med min Sony KDL-46W4500, men som jag skriver i texten så har jag upplevt problem med sk. bleeding när jag har vardagsrummet nersläckt och det visas mörka scener på tv:n. Det stör mig ibland. Bortsett från det är det en kanontv med många ingångar och utan anslutningsproblem. Det är verkligen plug-n-play. Jag använder iPhoto för att sortera och visa foton. I och med att tv:n är pixelmappad och full-HD blir det mycket bra upplösning. Jag använder den titt som tätt för arbete i Photoshop/Illustrator och enda problemet som jag upplever är att det är för bra upplösning då man måste sitta väldigt nära tv:n för att kunna urskilja alla detaljer. Av den anledningen kör jag nerskalad upplösning till 1600 x 900 px. Hur bra (och korrekt) grafik återges på tv:n beror extremt mycket på dess inställningar. Men till skillnad från billigare tv-apparater med få inställningsmöjligheter har du med W4500-serien stor frihet att tweeka det mesta (men jag antar att du pratar om W5500?). Hej Anders, jag har en Pioneer PDP-LX5090H som jag är väldigt nöjd med. Har en Tvix box kopplad till den men den visar inte bilder så bra (lite seg att bläddra mellan korten men kanon bra för HD filmer ) Har funderat på en PS3 men en MAC Mini verkar vettigare eftersom man kan göra så mycket mer. Antar att MAC Mini bläddrar snabbt mellan bilderna? Hej Peter! Jag har mina bilder på hårddisken och därifrån är det inga som helst problem att öppna/visa dem. iPhoto är både snabbt och responsivt. Ibland kan det dock vara någon sekunds fördöjning innan första bilden dyker upp när man ska visa en “slideshow” i iPhoto. Antar att det beror på att iPhoto laddar in flera bilder åt gången när den ska visa en slideshow. I sorteringsläge och vid visning av enskilda bilder är iPhoto mycket snabbt. Men eftersom du verkar ha all din media på en NAS så blir så klart nätverkets hastighet en flaskhals. Har du 100 MBit-LAN borde det dock inte vara några problem. Jag tror inte att du behöver oroa dig så länge du sitter på ett någorlunda snabbt nätverk. Hej Anders, har 1Gbt-LAN nätverk så det går nog bra :-). Får nog bli en MAC Mini, då kan jag även surfa och köra t.ex SVT play och en massa annat. Spännande med första MAC. Har nu beställt Ser framemot leverans. Återkommer hur den fungerar när jag satt upp allt. Fick tips om denna sidan och det är ju en fantastisk sammanställning. Anledningen att jag började leta efter denna typ av info var att vi var hemma hos en kompis som hade AppleTV och då ville frugan ha samma “för den visade iphoto-bilderna så fint”… Men ska man ändå lägga ner de pengarna så är det väl lika bra att bygga på en riktig dator. Har haft många Macar genom åren (första 1986…) så att konfigurera den delen ska inte vara några problem. Däremot är jag fullständigt ointresserad av det mesta vad gäller TV, vi har fortfarande en gammal tjock-TV i vardagsrummet. Grabben har dock en billig LCD från Netonnet (Andersson) på sitt rum kopplat till TV-spel och hans bärbara Dell (Mac var för dyrt till honom tyckte jag då, men så många timmar som vi lagt ner på att fixa problem så vete sjutton om det inte varit billigare med en Mac till honom också från början). Märkte på Andersson-TVn att när man kopplade den till datorn via HDMI fick man kass bild därför att Dell-datorn hade inte samma upplösningsalternativ i grafikkortet som TVn så det blev till att koppla via VGA istället. För att slippa samma bakslag vad gäller TV:n igen, finns det fler som som satt upp Mac mediacenter nyligen som kan tipsa om TV-modeller som fungerar bra? Eller vad är det man ska kolla efter – TV ska stödja upplösning via HDMI på X*Y pixlar? Hej Ulf och tack för responsen! Jag brukar säga att man får vad man betalar för. Skulle du köpa en 46″ tv idag för låt säga 10-18 000 så får du med största sannolikhet en “bra” tv. Som du ser i min blogg så talar jag mig varm för Sonys grejor, men jag tror nog att även Samsung och Panasonic – för att inte tala om Pioneer – gör bra grejor. Även Philips tv-apparater i dom lite högre prisklasserna tror jag är bra val. Men snåla inte. Det blir hur som helst ett hål i plånboken, och då är det bättre att vara pank och nöjd än tvärtom anser jag. – Att användarrecensionerna inte är negativa. Har nu fått min Mac Mini och den fungera perfekt!! Stort tack för denna sida med all bra info! har problem med att köra spotify via plex på min mini. det har fungerat förut men inte nu längre. när jag försöker starta spotify händer ingenting. försökt uppdatera, starta om, installera om men inget hjälper. någon som har tips om jag gör fel lr är det någon bugg ? Kollar man på Plex-forumet så är du inte vara ensam om att ha problem. Spotify-pluggen verkar vara skapad genom “reversed engineering” för att det inte finns något API offentligt tillgängligt. Därför är det också många buggar. Det är bara att invänta en stabilare version eller att söka igenom forumet efter en lösning. Jo det verkar vara som du säger. Men är det bara vissa som har problem eller? Hur fungerar det för dig och er andra? Själv har jag ingen aning tyvärr, då jag inte har något Spotify-premiumabonnemang. Macbook Pro 13″ som används för att slösurfa och dela bildskärm för att lägga över filer osv till de olika diskar mm. Kommer bytas ut mot en iPad!! Mac Mini med MiniDisplayport kopplad med HDMI till en Pioneer 60″ Kuro och jag kör Plex. Till mitt närverk Fiber 100 Mbit har jag en huvudenhet Apple Airport Express Dualband som delar ut ett trådlöst nätverk 802.11n till bärbara datorn samt iPhones och PS3. Mac Mini och iMac är kopplad med Cat6 kablar och kör Gigabit ehternet, sedan har jag 1st NetGear ReadyNas Pioneer Edition som aggerar Mediahubb där jag lagrar mina filmer osv. Överföringen till denna ligger på ca 90Mb / sek jag får bättre prestanda att kopiera filer till denna mot vad jag får till en Ext. FireWire 800 hårddisk från iMacen vilket jag tycker är grymt snabbt. Allt styr jag med en Logitech 1100 Fjärrkontroll använder inte ngn mus eller tangentbord till Mac Minin, Remotebuddy är min vän och iPaden kommer vara enheten som får vara mellan och aggera slösurfandet i soffan. först – ett enormt tack för en oerhört bra genomgång! Din artikel tog mitt allmänna sug efter denna lösning till affären, och idag kopplade jag in min Mac Mini i min teve. Jag har en likadan teve som du, och kör 1080-upplösningen och får den svarta borden som du pratar om. Men jag hittar inte overscan i mina inställningar, har du möjlighet att guida mig dit? Var hittade du inställningen? Men du måste även kolla så att du i Macen, under Systeminställningar -> Bildskärmar -> Alternativ, har “Maximal bildyta” ikryssad. De här inställningarna funkar utomordentligt bra för mig i upplösningarna 1600×900 (60 Hz) och 1920×1080 (60 Hz). Hör av dig om du inte får till det! Tack! Nu fick jag till det. Det är verkligen en schysst upplevelse att på ett så här enkelt sätt få tillgång till allt Playmaterial och enkelt kunna köra all musik och alla filmer vi en liten låda på tevebänken. Kan man kombinera Mac Minin med Eye Hybrid med min digitalbox från ComHem? Jag har för mig att jag har läst om folk som har kört in DVB-C-signalen från ComHem in i EyeTV-stickor. Eftersom nyaste Hybriden klarar av både DVB-T och DVB-C borde det inte vara några problem. Sök på Google så hittar du säkert ett svar. Tack för en mycket välskriven guide Anders. Har kopierat vissa delar här och var från din guide (hade en del uppsatt sen tidigare). Har inte orkat sätta upp allt i tid och otid, för det finns för mycket att pilla med, men jag måste säga att EyeTV (har com hem digital), Logitech Remote Harmony, Remote Buddy och Mac Mini slår det mesta. Tillsammans med Eyetv-Iphone appen missar jag numera inga program :). Hur kopplar du Hybriden i relation till digitalboxen? Kan du se samtliga kanaler i ditt Com Hem utbud? Tack för en underbart bra sida. Jag försöker få in de svenska radiokanalerna (SR, Rockklassiker NRJ osv) i Plex. Den plug in du länkar till ser OK ut men är ganska seg att starta (buffrar ganska länge). Dessvärre fungerar bara SR för mig – de andra kanalerna går inte att spela. Då du verkar ha stenkoll på allt med Plex undrar jag om du kan hjälpa mig med detta. (Webradion är den sista pusselbiten för mig för att Plex och min Mac Mini skall bli mitt fullvärdiga Mediacenter). Kul att du uppskattar min blogg! Jag är själv inte insatt pluginprogrammeringen till Plex, så tyvärr kan jag inte hjälpa dig med den biten. Angående buffringsproblemet tror jag att detta kan lösas genom att gå in i Plex inställningar och leta efter buffringsinställningen. Om det sedan hjälper är en annan fråga. 1. Skriva ett önskemål till Deli i den här tråden om att du gärna skulle vilja se en utvecklad variant av pluginen. 2. Försöka snickra ihop en m3u-spellista i exempelvis VLC med de radiokanaler du vill ha och sedan använda den i Plex. Det kan fungera. Tusen tack för snabb hjälp. Jag vill minnas att jag från tidigare försök (innan jag fann Plex) har fixat en m3u-spellista i VLC. Ska det vara en spellista med alla kanalerna eller ska det vara en lista per radiokanal? Hur får jag i sin tur in den spellistan/spellistorna i Plex? Under vilken rubrik hamnar den i Plex? Hej igen! Jag skulle tro att det funkar om du lägger alla kanalerna i samma spellista, du får helt enkelt pröva dig fram. Filerna borde det gå att bara lägga i någon mapp som du har åtkomst till genom Plex, t ex mappen där du har dina filmer (det heter säker “Add source” eller nått inne i Plex). Ett annat liknande sätt är att använda QuickTime Pro och öppna URL:er och sedan spara dem som antingen “fristående filmer” eller som “referensfilmer”. F n har jag inte möjlighet att testa själv, tyvärr. Jag laddade ner din fil och det står “Harmony knapp- Remote buddy reference”. Hur skall jag fixa? 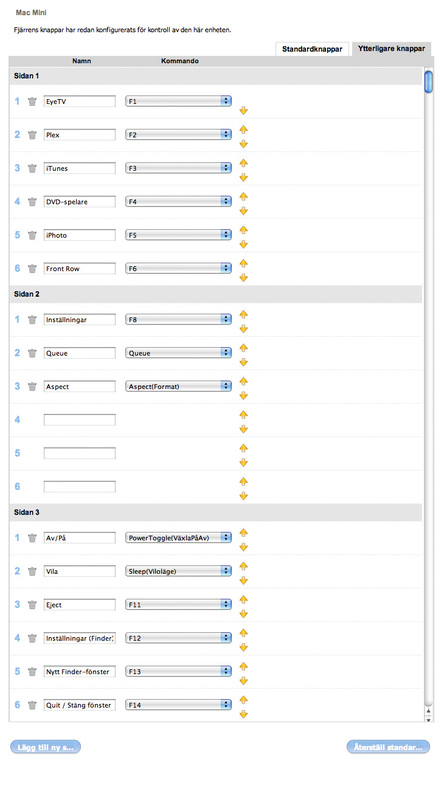 är det under i RB preferences-mapping-globa mapping? I så fall hur? Din första fråga förstår jag tyvärr inte vad du menar. Du måste förklara närmare. Din andra fråga: Referensfilen använder du för att mappa rätt (fysisk) Harmony-knapp till rätt (virtuell) Apple Remote-knapp. Har du konfigurerat Harmony-fjärren korrekt (med Plex Player-konfigurationen) så kan du använda referensfilens två kolumner till att se vilka Harmony-knappar som matchar mot vilka kommandon inne i RemoteBuddy. Med “globala knappar” menar jag funktioner som t ex volymjustering och RemoteBuddy-menyn. Dessa knappar/funktioner anser jag bör ligga på samma knappar, oavsett vilket program du har aktivt. Dessa bör alltså vara globala (under Mapping -> Global Mapping). Alla knappar som läggs till under Global Mapping försvinner från de övriga programmens mappningslistor och blir därmed inte valbara i dom. Hej Anders o tack för ett makalöst bra jobb !! Kan jag få ett råd, ska jag inhandla den nya eller “gamla” minin till mitt kommande mediacenter? Har idag min macbook som m.center funkar jättebra förutom mobiliteten, ska därför köpa mig en mini. Har läst någonstans?? att grafikkortet på nya minin inte är lika bra som på gamla…? Har igentligen inget behov av HDMI eftersom jag kör optiskt till recievern, om HDMI inte innebär en förbättrad bild förstås ! Tacksam om du ville hjälpa mig! Jag skulle definitivt inte köpa en Mini äldre än 2009-modellerna. Det som skiljer dessa från föregångarna är grafikchipet Nvidia 9400M som ger betydande prestandaförbättringar för h.264-video i vissa program (Plex och QuickTime). Även de nyaste Minisarna har, vad jag förstår, h.264-acceleration. Den enda nackdelen med 2010-modellerna, som jag ser det, är att strömadaptern är inbygd (tidigare var den extern). Detta medför troligen att det alstras mer värme i burken, vilket i sin tur kan göra att fläktarna körs onödigt mycket och ge datorn kortare livslängd. Dessutom är det svårt/dyrt att byta strömaggregatet om det pajar. Jag kör DVI->HDMI och ljudet separat (analogt tyvärr). Jag kan inte tänka mig att en sådan lösning ger sämre bild än HDMI-direkt. Fördelen med de nya Minisarna är dock att även ljudet går via HDMI-utgången. Hej igen Anders o tack för svaret! Har några fler undringar – supertacksam för din hjälp! Varför har du analogt mellan DVI->HDMI, jag trodde det var digitalt?? Jag har nu bestämt mig för en 09:a mini men undrar du tycker 2 gig minne räcker? 09: orna är ju på väg ut så utbudet är inte så stort på dom längre. Va bra att du tog upp detta med mer värmealstring i nya “minisarna”, har nämligen läst en del om störande fläktar i dom. Jag har läst att det går att trycka in upp till 8 GB RAM i ’09-Minisarna. Även om det är ganska knepigt att eftermontera RAM i de Minisarna kan du ju vänta med att uppgradera minnet tills du verkligen behöver det. Men du bör vara medveten om att 2 GB är på gränsen. Har läst denna sidan hela kvällen med stor behållning. Önskar att jag hittad detta tidigare då mycket jag har hittat runt om på nätet sedan finns samlat på en ställe väl beskrivet. Funderar nu på om jag ska skaffa en Harmony och denna sidan gav mig mycket. Hatten av! Får man fråga om du tror enklare Harmony modeller skulle funka nästan lika bra eller måste man ha Harmony One med touch screen för att få till egna namngivna aktiviteter? Starta/stänga av tv, dvd, stereo etc. På min Harmony One har jag virtuella knappar för bland annat “TV på/av”, volym (separata för tv/stereo/Mac) och för att starta specifika program. Jag vet inte om det enkelt går att utföra dessa, för mig väsentliga, kommandon med de andra Harmony-modellerna. Ett problem som jag ser det är att du hela tiden får växla enhet eller aktivitet för att hitta det kommando man vill utföra. Som information så har jag aldrig riktigt blivit vän med på/av-knappen längst upp till vänster på min Harmony. Jag förstår helt enkelt inte hur jag på ett smidigt sätt använder den. Om det inte finns någon smidigare av-/på-knapp på de andra Harmony-modellerna, ställer det onekligen till problem i och med att du inte kommer att kunna starta/stänga av dina prylar. Det är möjligt att dom är funktionsmässigt likvärdiga med Harmonyn, fast enklare att konfigurera, men det kan jag tyvärr inte svara på. Jag tror att alla (?) Harmony har någon form av möjlighet att t.ex “Watch TV” och den startar rätt apparater och sätter rätt ingångar osv men jag vet inte om detta inskränker sig till några få fysiska knappar på de enklaste. Inte så lätt att läsa ut från tillverkarens hemsida som man kunde önska. Kanske är våra behov inte det första tillverkaren tänkt på? Det där med starta/stänga av måste vara ett generellt problem med multifjärrar då de delar knapp så att säga och det finns ju ingen bakåt signal som kan berätta om enheten var på eller av. Hur löser du det? Ser du till att alla prylar sätts på (det är ju inte så många) och av på alla “starta/stoppa funktioner”? Om ingen är och tjuvstartar en enskild pryl lär det ju funka. För det första så delar jag din upplevelse ovan angående dålig analog bild via elgaton. Det har gjort att vårt beteende har skiftat till att använda TVs tuner. Detta trots att vi har ComHem och får in en del av de vanligaste kanalerna digitalt men t.ex. 3an och 5an går analogt och det räcker för att man ska tycka det blir bökigt och väljer TVn. Jag tror som du att en iPod Touch skulle kunna användas med fördel, kanske via WiFi med t.ex. Ajax till remote buddy (inte insatt) men jag tror inte den skulle bli liggande på soffbordet om du förstår vad jag menar. :). Jag kan ju använda min iPhone men den det är nog helt klart värt att ha något som alltid är vid soffan. Jag tror jag innan jag köper en Harmony One (som jag känner är det givna alternativet just nu) ska mjuka upp med att testa att få in vissa knappar från ljudanläggnings fjärr som inte används då jag ej har någon DVD-spelare eller något liknande. Jag bör kunna mappa upp play, pause, skip up, down, left, right, mm så att jag slipper ha min lilla vita. Jag ska se när jag får tid till det. För övrigt liknar min setup din med bara mindre skilnader. Puzzelbiten som saknas är vettig styrning. Jag använder. Ljudfjärren, TV fjärren, den lilla vita, tangentbord mus om vartannat. Jag tycker det är bökigt och min sambo och mina barn ska vi inte prata om. Till sist tycker jag vi borde starta någon slags grupp för utbyte av erfarenheter runt våra mac-mini mediacenters till hjälp för oss själva och andra. Måste korrigera mig själv. Jag kan ju givetvis inte få fjärren till mitt ljudsystem att skicka annat än den är programmerad till så den kan ju inte härma en apple remote och prata med remote buddy såklart. Jag tänkte inte främst på avsaknaden av diskreta ir-koder, utan mer på problemet att Harmony One saknar en programmerbar, fysisk on/off-knapp. Den on/off-knapp som finns kan du bara använda under “Aktiviteter” och även där är den mycket svår att ge någon vettig funktion. Dess inbyggda “smarthet” anser jag i själva verket är dess dumhet. Här kan du läsa lite om problemet. Istället har jag skapat virtuella knappar under varje aktivitet som gör det möjligt att starta/stänga av varje enskild enhet när jag vill. Ingen av dessa startar alltså automatiskt någon av mina enheter (tv:n, macen, receivern) utan växlar bara input/output på dessa. Detta pga frustrationen OM någon av dem skulle hamna i osynk on/off-mässigt. När du skapar aktiviteter i konfigurationsprogrammet anger du vilka enheter som ska vara på respektive av när du väljer (eller går ur) aktiviteten i fjärren. Detta av- och påslagande sker automatiskt och kan därför bli riktigt knäppt om ir-signalen inte skulle nå fram till enheten. Visst, det finns en felsökningsfunktion på Harmony One som hjälper dig om något liknande skulle hända. Jag föredrar dock det gamla hederliga, manuella sättet att slå på/av mina enheter. Och det är detta jag undrar över hur väl det fungerar i de andra Harmony-modellerna. För mig – som använder Harmony One – är de virtuella on/off-knapparna ytterst viktiga. Ahhh, jag förstår hur du menar. Att sätta på alla enheter med en aktivitet är ju annars en eftersträvansvärd funktion. Jag tittar lite på 600-modellen (http://www.logitech.com/sv-se/remotes/universal-remotes/devices/6620). Den har monochrom skärm och blir därmed billigare. Det ser ut som knapparna vid skärmen används till aktivitetet. Eller hur tycker du det ser ut? Jo, det kan säkert räcka med 600/650-modellen. Det har gått en tid. Har du lyckas lösa stänga av/på med diskreta ir signaler så att apparaterna inte kommer i osynk? Lustigt nog har dock knapprofilen för min tv – den som jag hämtade hem från Logitechs hemsida när jag skulle ställa in Harmonyn – uppdaterats sedan dess. Nu finns även diskreta kommandon med i profilen, men tyvärr så funkar dom inte (dom beter sig bara som de “normala” motsvarigheterna). Att det inte fungerar kan bero på att profilen är anpassad för en japansk version av tv:n och inte den europeiska, som jag har. Det är i alla fall vad jag gissar. Vill börja med att tacks för mycket bra info och inspiration. Jag tänkte att det kanske är ngn här som har ett svar på en fråga jag kring min setup. Jag har Mac mini 2011 hdmi till tv med magic mouse och wireless keyboard samt en iPad 1 som jag vill använda att styra via iteleport. Nu till mitt problem, jag kan inte se muspekarens rörelser på ipaden när jag rör magic mouse (som är kopplad till Mac mini), finns det nån inställning i iteleport som kan skapa detta, eftersom jag vill använda iPad som en extern skärm ihop med mitt tangentbord och min magic mouse? Jag vill alltså kunna använda både iPadens touchmus funktion och den till Mac minin kopplade magic mouse. Tacksam för hjälp, ställ gärna frågor om ni inte fattar mitt problem. Tack för dom uppskattande orden! Testa något annat VNC-program till iPad. Testa att använda ändra inställningarna i Macen under Systeminställningar -> Hjälpmedel -> Mus. Där går det att göra muspekaren större, vilket kan lösa ditt problem. Testa att använda något HID-program, typ ControllerMate, för att modifiera musens beteende. Det kan ge effekt i iTeleport. Testa och återkom med resultatet! Roligt att höra! Det är egentligen inte SÅ komplicerat som det verkar. Den enda egentliga svårigheten är Harmony-fjärren, som är lite komplicerad att konfigurera.